Yes, some days they drive me totally crazy. Some days I want to give them away. Some days I cannot wait until bedtime. But that’s not even 50% of the time, not even 25% of our days. No, most days I truly enjoy being home with them. There’s nothing quite so rewarding as seeing them learn, guiding them through challenges, encouraging them when they are frustrated. Being home with them allows me to experience the process of learning alongside them. And I get to see so many personality quirks, enjoy the funny moments, and overhear some crazy conversations. I am also able to watch them play together and imagine and dream and just be kids. They can play outside or spend an hour playing legos in the middle of the day. It’s so very worth it for both me and for them. So, while I have crazy days and I can admit to them-I can also attest to those days being the exception and not the norm. I think in our quest to show others the benefits and privilege of homeschooling, we are sometimes less than honest. I think we hide behind our smiles and pretend our children are angelic and that we love them dearly. Certainly we like them all the time. No they never drive us crazy. No, we’d never be separated from them-we’d miss them too much. We just love homeschooling! But I think that’s a disservice to ourselves and to those around us. Homeschooling is hard! It is so much work, so much time, so much effort. It is a challenge. And being home with little people all day can be so tiring. Homeschooling is a full time job. It’s ok to admit that some days you don’t love your job. That doesn’t mean that you quit. It just means that you’re brave enough to be honest with others and yourself. 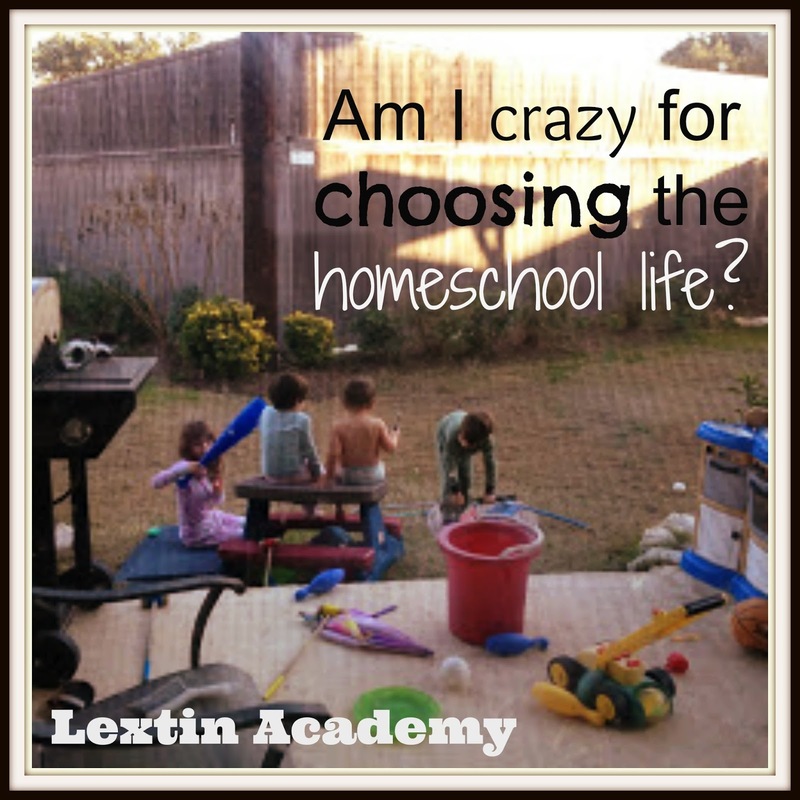 I think it’s important that others see homeschooling as a wonderful and exciting endeavor but also a challenging one. Then again, you don’t want to spend all your time talking about the difficulties with your children. If you’re a parent, you’ve had long, tough days with your kids-homeschooler or not. So, that’s why I’m quick to clarify that the challenging days are not the rule at our house, but rather the exception. Most days, I sit back and watch my kids as they learn and play and I feel such a sense of accomplishment and peace. Homeschooling is a privilege. I may not always enjoy it, but I see the benefits and I see the results it brings. Yes, my children sometimes drive me crazy. Yours do too. But we’re used to spending our time together. We have our routine and our schedule and our way of doing things. We have our difficulties but we’re learning to work through them. Homeschooling provides so many opportunities to address behavior, exhibit grace, model forgiveness, and develop character. At our house, we’re all a work in progress. Oh, there are definitely days I want to pack them up and drive over to the local school! But that always passes and we perservere. Great post! Well said! My kids definitely drive me crazy some days, but I can't imagine doing our lives any differently. It's a fun kind of crazy! It is a good kind of crazy! We've had a hefty dose of the February "blahs" and daddy having an absolutely insane work schedule with no days off, so I'm feeling this post today! It's definitely not the norm for us either, but I agree–it's healthy to acknowledge that it's not all sunshine and butterflies everyday. February can be so challenging. It seems we always get sick with something terrible in February. Homeschool is not always easy. Sometimes it's just not fun at all. And it's ok to admit it!